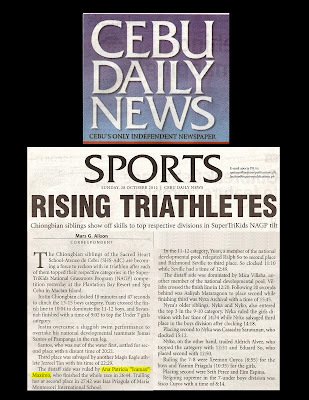 The Chiongbian siblings of the Sacred Heart School Ateneo de Cebu (SHS-AdC) are becoming a force to reckon with in triathlon after each of them topped their respective categories in the SuperTriKids National Grassroots Program (NAGP) competition yesterday at the Plantation Bay Resort and Spa Cebu in Mactan Island. Justin Chiongbian clocked 18 minutes and 47 seconds to clinch the 13-15 boys category, Yuan crossed the finish line in 10:44 to dominate the 11-12 boys, and Savannah finished with a time of 9:02 to top the Under 7 girls category. 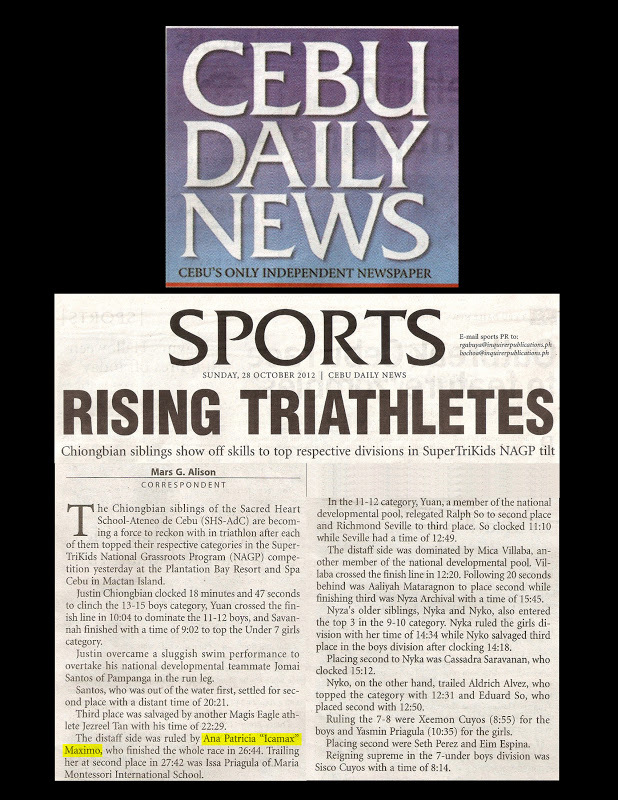 Justin overcame a sluggish swim performance to overtake his national developmental teammate Jomai Santos of Pampanga in the run leg. Santos, who was out of the water first, settled for second place with a distant time of 20:21. Third place was salvaged by another Magis eagle athlete Jezreel Tan with his time of 22:29. The distaff side was ruled by Ana Patricia "Icamax" Maximo, who finished the whole race in 26:44. Trailing her at second place in 27:42 was Issa Priagula of Maria Montessori International School. In the 11-12 category, Yuan, a member of the national developmental pool, relegated Ralph So to second place and Richmond Sevilla to third place. So clocked 11:10 while Sevilla has a time of 12:49. The distaff side was dominated by Mica Villaba, another member of the national developmental pool. Villaba crossed the finish line in 12:30. Following 20 seconds behind was Aaliyah Mataragnon to place second while finishing third was Nyza Archival with a time of 15:45. Nyza's older siblings, Nyka and Nyko, also entered the top 3 in the 9-10 category. Nyka ruled the girls division with her time of 14:34 while Nyko salvaged third place in the boys division after clocking 14:18. Placing second to Nyka was Cassadra Saravanan, who clocked 15:12. Ruling the 7-8 were Xeemon Cuyos (8:55) for the boys and Yasmin Priagula (10:35) for the girls. Placing second were Seth Perez and Eim Espina. Reigning supreme in the 7-under boys division was Sisco Cuyos with a time of 8:14.